Republished from the original site. 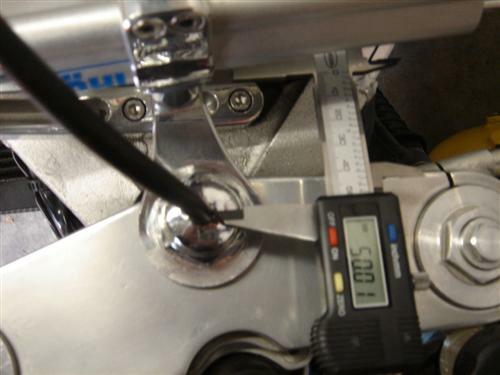 It’s been noticed recently that a lot of people want to know what calipers are a straight swap to upgrade their bikes with no problems, and without having to go to the effort of making up a set of adapter plates. 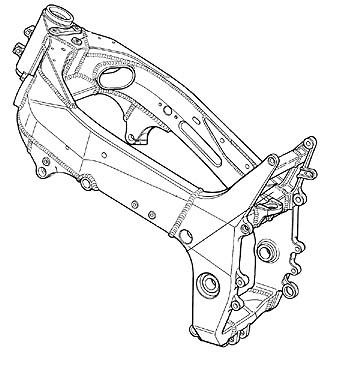 So if your bike is listed in the same section as another bike below, you can change calipers without any worries. For ease I shall just call the calipers type 1, 2, 3, 4 and 5. 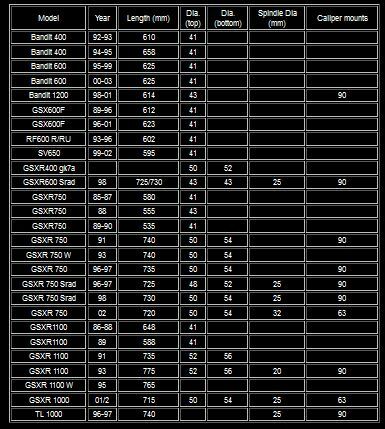 Saved from the old site this chart details the dimensions for a range of different rear shocks including those from non Suzukis. Journey to the center of Mikuni’s BST38SS carbs. When I was studying my new 38mm slingshot carbs my eyes fell on the small rubber hose which runs along the outside of the carbs from the float chamber to somewhere above the intake. I disconnected the hose and started tracing the circuit inside the carb.I did this by reconnecting the hose to one of the fittings and bowing into it. So by hearing where the air escapes you know the routing of the circuit. The top fitting connects to the uppermost hole in the bellmouth, but when I blew into the fitting of the float chamber I seemed to have hit a dead end because there wasn’t any air escaping. I noticed a small plug which looked like a jet inside the float chamber. I removed it and now I could blow trough it. First I thought the jet had been clogged but after closer inspection it really was a plug instead of a jet. So there was a hole in the bellmouth that connected to the float chamber, but the hole was plugged. I had some sleepless nights trying to figure out what the function of this would be. 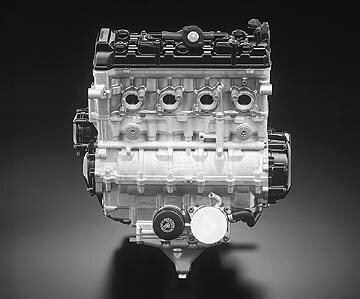 Power jet carbs – Mikuni’s great addition to a carb used in a high rpm application. 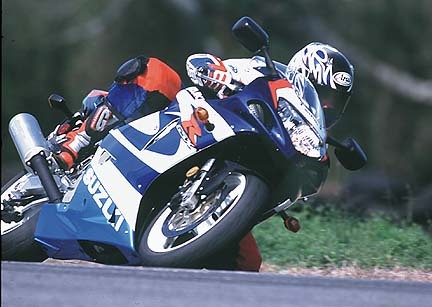 The power jet adjusts high rpm mixture, in the gsxr750 – from 10 to redline, in 1/3rd the step of a main jet change. 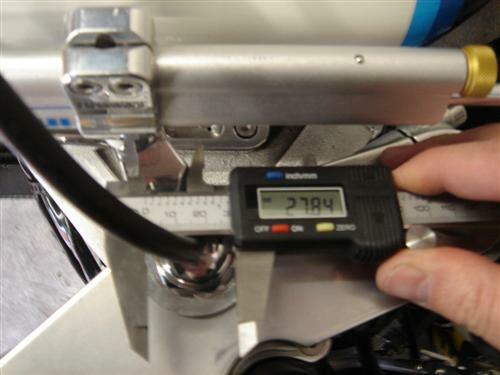 Changing a main jet, in the 38mm carb, as installed on the gsxr750, adds or subtracts up to 2% CO per main jet change – when the CO% needs to be adjusted in in .2%-.4% for best power attainment. Changing the power jet allowed much finer increments of change and, just as critically, happened to change the fuel delivery curve to what was optimum for the gsxr750 – something that would have required main air jet changes and other modifications to attain, but would still leave the main jet fuel delivery steps too coarse. Strange. This Powerjet circuit works wonderfully when tuned on the stock airboxed gsxr750 (and it’s pretty straightforward to tune on our EC997 Low Inertia Eddy Current dynamometers unlike simple inertia dynos. The method of operation is as follows. 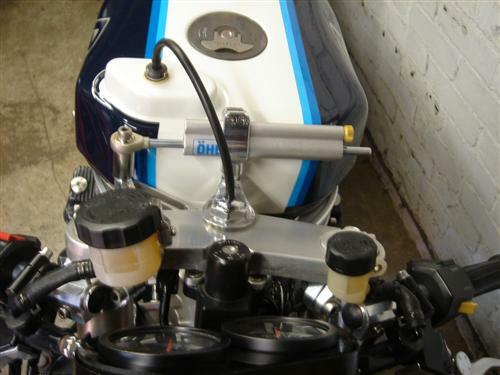 At full throttle, as the rpm increases, at exactly 10k, there is enough of a pressure differential between the float bowl and the airbox interior to draw fuel up the black hose on the LH side of the carb and exiting through the hole at the top of the bellmouth of the carb. The fuel is metered by a jet that is located in the bottom of the float bowl. The jets are sized in increments of 2.5 or .025mm. 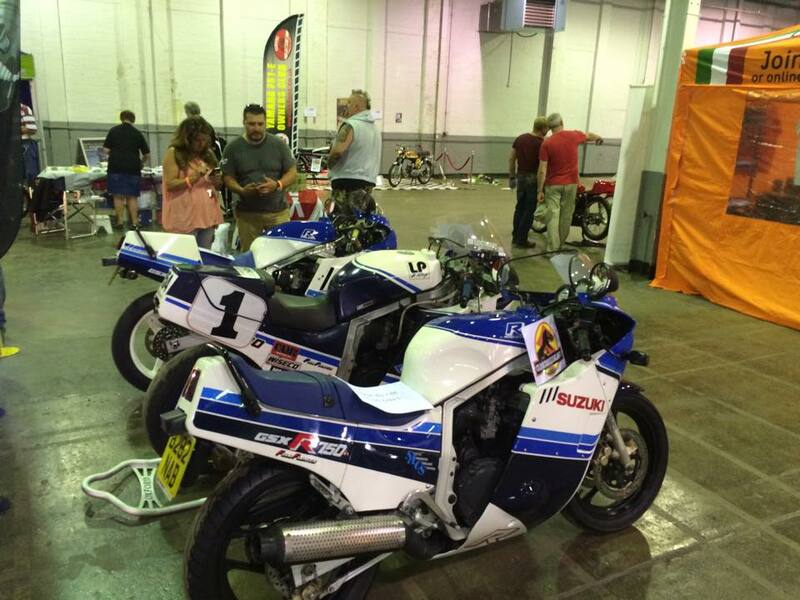 Usual size for a gsxr750 with a stock airbox and air filter might be between #58 to #67.5. The power jet circuit, when properly tuned, adds the equivalent of 2-3- main jet sizes “on top” of the main jet, so, if you were not using the power jet circuit, i.e. 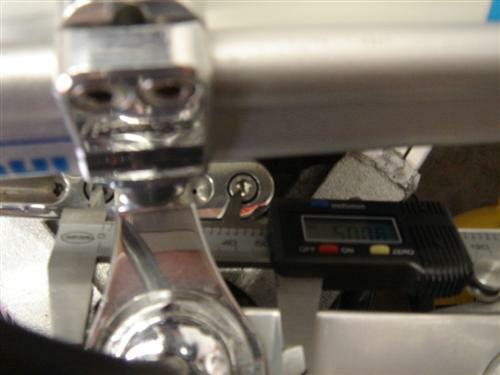 had a “0” or blanked jet installed with a #125 main jet, you would use a #117.5 with a #62.5 power jet installed. 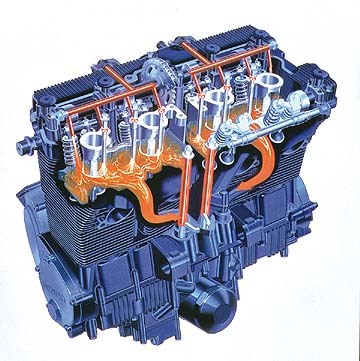 Since this particular circuit works on the pressure difference between the float bowl and the airbox interior, it is absolutely affected by any change in the pressure differential. If the air filter is changed to less restrictive unit or the airbox inlet is modified, creating less restriction – the power jet area (size) should have to be increased above the usual size, though, a BMC or K&N, as installed for stock replacement, may only require 1-2 sizes increase in the power jet (in addition to +2-+3 on the main jet circuit). 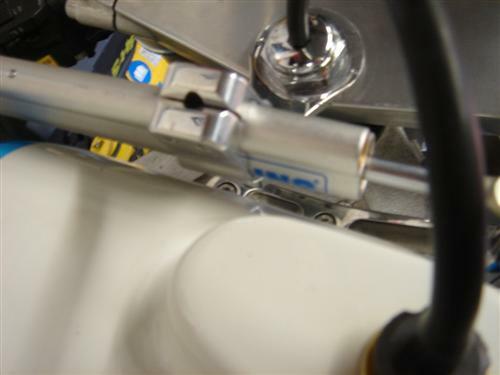 If the airbox is removed, there is no longer a sufficient pressure differential to pull the fuel up the ~2.5″ vertical rise from the float bowl to the outlet in the bellmouth and the circuit is no longer effective. 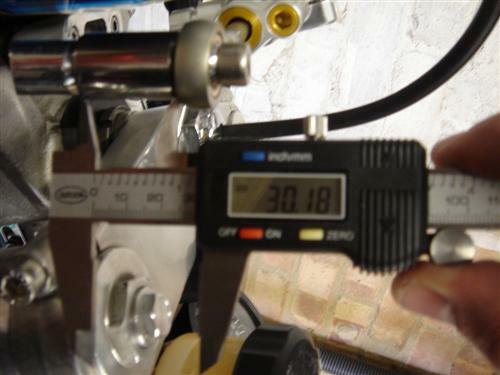 Why is the Powerjet circuit difficult to tune on a simple inertia dyno and easy on our EC997 Low Inertia dynamometer? 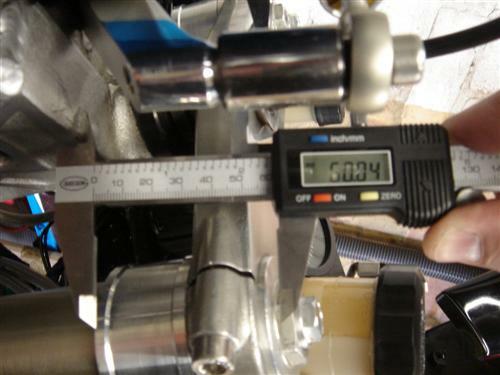 According to the former owner of Dynojet, the powerjet circuit simply doesn’t work because there is a lag in fuel delivery at 9.5k rpm – creating a flat spot there. 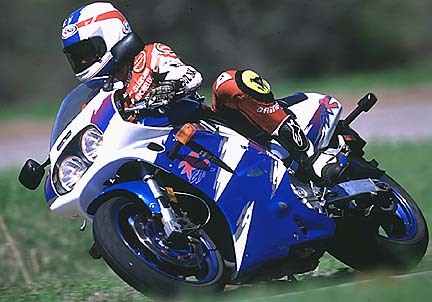 It turns out that the reason that he saw that is that the dynojet dyno has insufficient load to simulate the Real World Loading ™ that is present on the bike in 4th and higher gears on the road or track. There is a slight delay in the onset of Powerjet fuel delivery, but it’s only vaguely present in second gear in the real world, and not present in higher gears due to the slower acceleration rate that occurs when you are actually riding. 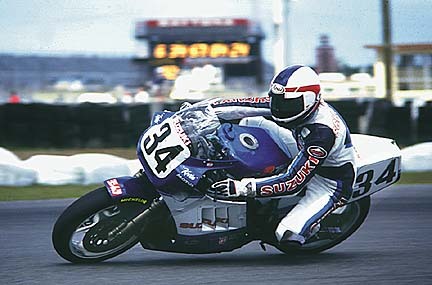 If you were racing, as Yoshimura USA and other non sponsored, large US Suzuki sponsored teams (we lent them carbs for the Finals) verified, the kit outperformed anything dynojet had to offer. 1. Install the main jet that produces the best power at full throttle / 8k-9k. 2. Install the powerjet set that produces the best power at full throttle / 10k to redline. 3. Raise or lower fuel level to get best power at full throttle / 3k. 4. Recheck main jet and needle height if you needed to lower the fuel appreciably. 5. Adjust fuel screws for best idle. Note – this is the “short” tuning list! The size of the main jet DOES affect the low and midrange. Excess leanness isn’t usually the problem on these carbs. Using a #117.5 vs. a #122.5 main jet (PJ equipped vs. using a #0 PJ ) leans and crispens the lowend and midrange for better off idle and corner exit performance. 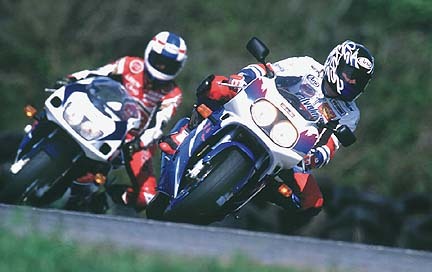 There other applications on other motorcycles that use circuits that are called “power jet” circuits that work on different principles – some are electronically controlled and work in the midrange like RGV250, the RS250 for upper topend, where they activate and deactivate through different ranges and still others work for different reasons and by different principles. 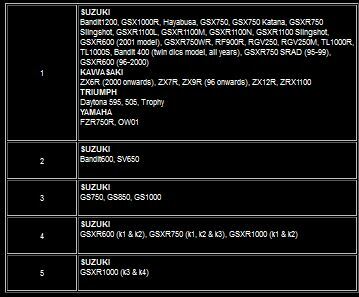 Why did Suzuki specify that US and UK models, for example would have a blank or “0” jet installed, disabling the circuit and other countries, like Canada, got the activated power jet circuit (though with pretty odd settings)? Emissions? I don’t think so. With the basic fuel level and needle settings virtually the same on both applications, using the larger main jet, as required with the circuit blanked, would only increase hydrocarbon emissions under measured conditions. 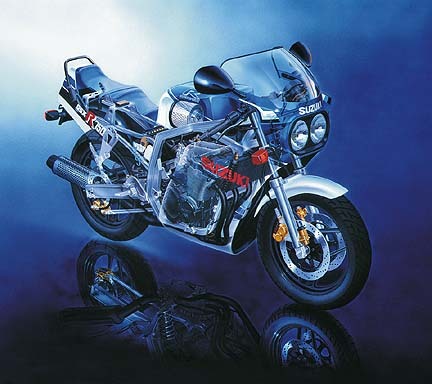 At any rate, the circuit works extremely well in dealing with the coarse main jet metering steps of the older style gsxr750 carbs – 1st through 5th place at the 1990 WERA Grand National Finals used our Factory Pro #CRB-S06-1.0 Carb Recalibration Kit. Pervasive kit use followed for the next couple of years -until 1992, the last year of the power jet. 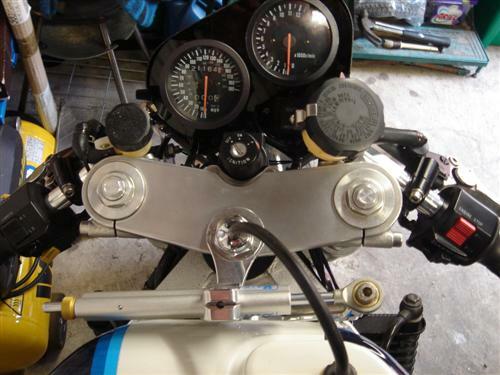 Says it al really, but what I can’t figure out is why mine have size 0 jets fitted as my carbs came from the UK and so should have a functional circuit according to the article. But anyway, as I am using separate K&N’s the powerjet circuit won’t be able to function properly so I removed the tubes and plugged the outlets inside the bellmouths. This way you won’t have to disconnect the tube every time you want to change the main jets which can save you a lot of dyno time and therefore money. Now you only have two screws for the top cap and two for the float chamber which makes them very service friendly. Thanks to Factory Pro for restoring my good night sleep! Now that we are talking carburation technology I would like to point out two other things that are important. A.) prevent dirt from entering the float chambers, maybe you’d even fit a small filter to the other and of the hose. A good and cheap trick is to nick some of your girlfriend’s nylons, put a piece of it at the end of the hose and keep it in place with a tie-rap. B.) create a kind of buffer for the air pressure below the diaphragms. This is very important for the same reason you need to add tubes to the fittings of the float chamber breathers. You need to connect a tube about 20 centimeters long to the fittings of the float chamber breathers which are located between carbs 1&2 and 3&4. If you don’t do that the air pressure inside the float chambers will become very perceptive to pressure changes outside the carb like when you get some sudden sidewind or pass a big lorry. I didn’t believe this at first until a dyno operator did a run before- and after fitting the hoses. 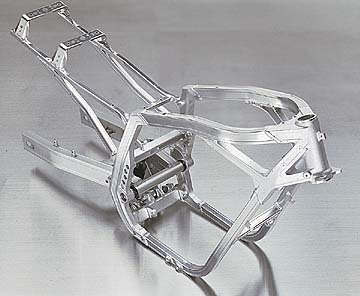 The hoses made the powercurve much smoother and therefore made it easier to choose the right jetting. 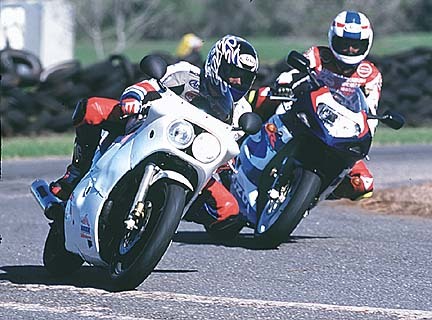 In the US, with a stock airbox, we didn’t have ANY problems with crosswinds, even 40-50mph gusting crosswinds at full lean at 100mph boogie. Actually, there is one problem – getting broadsided with a 50mph gust WILL push you off the track! 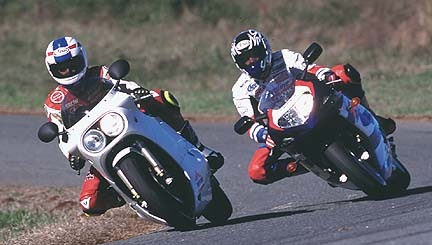 Willow Springs in southern California. 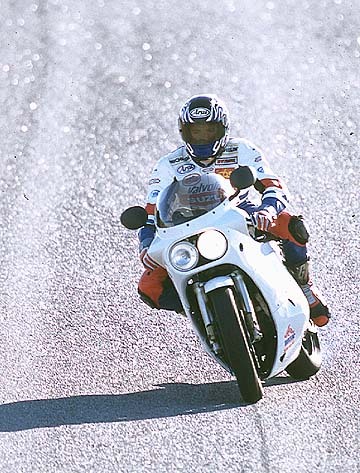 I thing that the biggest problem was the carb tuning as rides with our carburetion setups could: run with or without float bowl tubes, tuck their knee in of out, draft to the inside or outside of another rider while in a strong crosswind! It’s been a few years, but I definitely do remember the lack of problems with crosswinds. Urban myths started by someone in the States! Do the hoses affect the carburetion? Perhaps, to a very small effect. Less than running the bike again and increasing the crankcase temp 10F! The only thing I can say is that we did a run with- and without the tubes installed and the effect was very clearly visible on the dyno graph. So when you fit separate K&N filters be sure to fit those hoses for the horses! Thanks to Sandro Serafini, creator of Evo2 for the delicious carbs. A slice of fried gold from from the old site served up to you via the vault. 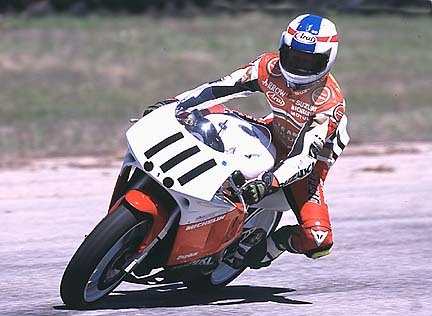 Pictures of Wes Cooley’s GS1000. All the detail you need for the perfect replica. The info is in the detail of these pictures. Pictures by Clink.